The Hashemite Kingdom of Jordan is a stable oasis in the Middle East, and its government often plays the role of mediator between neighboring countries and factions. Jordan came into being in the 20th century as part of the French and British division of the Arabian Peninsula; Jordan became a British Mandate under the UN's approval until 1946, when it became independent. The Kingdom of Jordan is a constitutional monarchy under the rule of King Abdullah II. He serves as the chief executive and the commander-in-chief of Jordan's armed forces. The king also appoints all 60 members of one of the two houses of Parliament, the Majlis al-Aayan or "Assembly of Notables." The other house of Parliament, the Majlis al-Nuwaab or "Chamber of Deputies," has 120 members who are directly elected by the people. Jordan has a multi-party system, although the majority of politicians run as independents. By law, political parties can not be based on religion. Jordan's court system is independent of the king, and includes a supreme court called the "Court of Cassation," as well as several Courts of Appeal. The lower courts are divided by the types of cases they hear into civil and sharia courts. Civil courts decide criminal matters as well as some types of civil cases, including those that involve parties from different religions. Sharia courts have jurisdiction over Muslim citizens only and hear cases involving marriage, divorce, inheritance, and charitable giving (waqf). 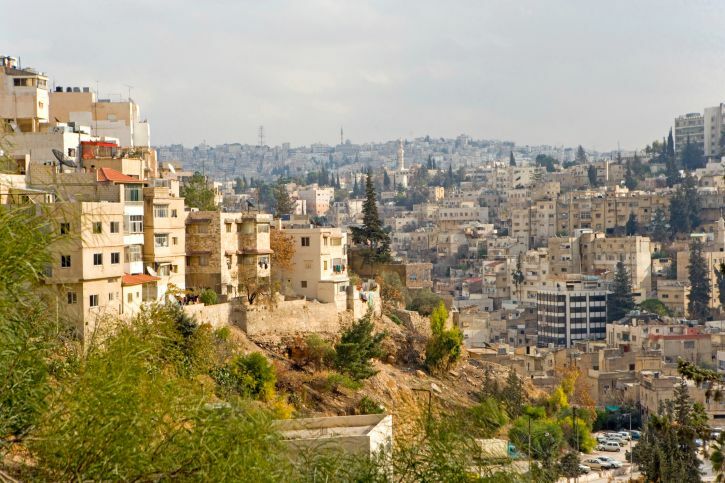 The population of Jordan is estimated at 6.5 million as of 2012. As a relatively stable part of a chaotic region, Jordan plays host to enormous numbers of refugees, as well. Almost 2 million Palestinian refugees live in Jordan, many since 1948, and more than 300,000 of them still live in refugee camps. They have been joined by some 15,000 Lebanese, 700,000 Iraqis, and most recently, 500,000 Syrians. About 98% of Jordanians are Arabs, with small populations of Circassians, Armenians, and Kurds making up the remaining 2%. Approximately 83% of the population lives in urban areas. The population growth rate is a very modest 0.14% as of 2013. Jordan's official language is Arabic. English is the most commonly used second language and is widely spoken by middle and upper-class Jordanians. Approximately 92% of Jordanians are Sunni Muslim, and Islam is the official religion of Jordan. This number has rapidly increased over recent decades, as Christians formed 30% of the population as recently as 1950. Today, just 6% of Jordanians are Christians - mostly Greek Orthodox, with smaller communities from other Orthodox churches. The remaining 2% of the population are mostly Baha'i or Druze. Jordan has a total area of 89,342 square kilometers (34,495 square miles) and is not quite landlocked. Its only port city is Aqaba, situated on the narrow Gulf of Aqaba, which empties into the Red Sea. Jordan's coastline stretches just 26 kilometers, or 16 miles. To the south and east, Jordan borders on Saudi Arabia. To the west is Israel and the Palestinian West Bank. On the northern border sits Syria, while to the east is Iraq. Eastern Jordan is characterized by desert terrain, dotted with oases. The western highland area is more suitable for agriculture and boasts a Mediterranean climate and evergreen forests. The highest point in Jordan is Jabal Umm al Dami, at 1,854 meters (6,083 feet) above sea level. The lowest is the Dead Sea, at -420 meters (-1,378 feet). The climate shades from Mediterranean to desert moving west to east across Jordan. In the northwest, an average of about 500 mm (20 inches) or rain falls per year, while in the east the average is just 120 mm (4.7 inches). Most of the precipitation falls between November and April and may include snow at higher elevations. The highest recorded temperature in Amman, Jordan was 41.7 degrees Celsius (107 Fahrenheit). The lowest was -5 degrees Celsius (23 Fahrenheit). The World Bank labels Jordan an "upper middle-income country," and its economy has grown slowly but steadily at about 2 to 4% per year over the past decade. The kingdom has a small, struggling agricultural and industrial base, due in large part to its shortages of fresh water and oil. Jordan's per capita income is $6,100 US. Its official unemployment rate is 12.5%, although the youth unemployment rate is closer to 30%. Approximately 14% of Jordanians live below the poverty line. The government employs up to two-thirds of the Jordanian workforce, although King Abdullah has moved to privatize industry. About 77% of Jordan's workers are employed in the service sector, including trade and finance, transportation, public utilities, etc. Tourism at sites such as the famous city of Petra accounts for about 12% of Jordan's gross domestic product. Jordan hopes to improve its economic situation in coming years by bring four nuclear power plants on-line, which will reduce expensive diesel imports from Saudi Arabia, and by beginning to exploit its oil-shale reserves. In the meanwhile, it relies on foreign aid. Jordan's currency is the dinar, which has an exchange rate of 1 dinar = 1.41 USD. Archaeological evidence shows that humans have lived in what is now Jordan for at least 90,000 years. This evidence includes Paleolithic tools such as knives, hand-axes, and scrapers made of flint and basalt. Jordan is part of the Fertile Crescent, one of the world regions were agriculture likely originated during the Neolithic period (8,500 - 4,500 BCE). People in the area likely domesticated grains, peas, lentils, goats, and later cats to protect their stored food from rodents. Jordan's written history begins in Biblical times, with the kingdoms of Ammon, Moab, and Edom, which are mentioned in the Old Testament. The Roman Empire conquered much of what is now Jordan, even taking in 103 CE the powerful trading kingdom of the Nabateans, whose capital was the intricately carved city of Petra. After the Prophet Muhammad died, the first Muslim dynasty created the Umayyad Empire (661 - 750 CE), which included what is now Jordan. Amman became a major provincial city in the Umayyad region called Al-Urdun, or "Jordan." When the Abbasid Empire (750 - 1258) moved its capital away from Damascus to Baghdad, to be closer to the center of their expanding empire, Jordan fell into obscurity. The Mongols brought down the Abbasid Caliphate in 1258, and Jordan came under their rule. They were followed by the Crusaders, the Ayyubids, and the Mamluks in turn. In 1517, Ottoman Empire conquered what is now Jordan. Under Ottoman rule, Jordan enjoyed benign neglect. Functionally, local Arab governors ruled the region with little interference from Istanbul. This continued for four centuries until the Ottoman Empire fell in 1922 after its defeat in World War I. When the Ottoman Empire collapsed, the League of Nations assumed a mandate over its Middle Eastern territories. Britain and France agreed to divide up the region, as the mandatory powers, with France taking Syria and Lebanon, and Britain taking Palestine (which included Transjordan). In 1922, Britain assigned a Hashemite lord, Abdullah I, to govern Transjordan; his brother Faisal was appointed king of Syria, and later was moved to Iraq. King Abdullah acquired a country with only about 200,000 citizens, approximately half of them nomadic. On May 22, 1946, the United Nations abolished the mandate for Transjordan and it became a sovereign state. Transjordan officially opposed the partition of Palestine and creation of Israel two years later, and joined in the 1948 Arab/Israeli War. Israel prevailed, and the first of several floods of Palestinian refugees moved into Jordan. In 1950, Jordan annexed the West Bank and East Jerusalem, a move that most other nations refused to recognize. The following year, a Palestinian assassin killed King Abdullah I during a visit to the Al-Aqsa Mosque in Jerusalem. The assassin was angry about Abdullah's land-grab of the Palestinian West Bank. A brief stint by Abdullah's mentally unstable son, Talal, was followed by the ascension of Abdullah's 18-year-old grandson to the throne in 1953. The new king, Hussein, embarked on an "experiment with liberalism," with a new constitution that guaranteed freedoms of speech, the press, and assembly. In May of 1967, Jordan signed a mutual defense treaty with Egypt. One month later, Israel obliterated the Egyptian, Syrian, Iraqi, and Jordanian militaries in the Six-Day War, and took the West Bank and East Jerusalem from Jordan. A second, larger wave of Palestinian refugees rushed into Jordan. Soon, Palestinian militants (fedayeen) began causing trouble for their host-country, even highjacking three international flights and forcing them to land in Jordan. In September of 1970, the Jordanian military launched an attack on the fedayeen; Syrian tanks invaded northern Jordan in support of the militants. In July 1971, the Jordanians defeated the Syrians and fedayeen, driving them across the border. Just two years later, Jordan sent an army brigade to Syria to help fend off the Israeli counteroffensive in the Yom Kippur War (Ramadan War) of 1973. Jordan itself was not a target during that conflict. In 1988, Jordan formally gave up its claim to the West Bank, and also announced its support for the Palestinians in their First Intifada against Israel. During the First Gulf War (1990 - 1991), Jordan supported Saddam Hussein, which caused a break-down of US/Jordanian relations. The US withdrew aid from Jordan, causing economic distress. To get back in international good graces, in 1994 Jordan signed a peace treaty with Israel, ending almost 50 years of declared war. In 1999, King Hussein died of lymphatic cancer and was succeeded by his eldest son, who became King Abdullah II. Under Abdullah, Jordan has followed a policy of non-entanglement with its volatile neighbors and endured further influxes of refugees.